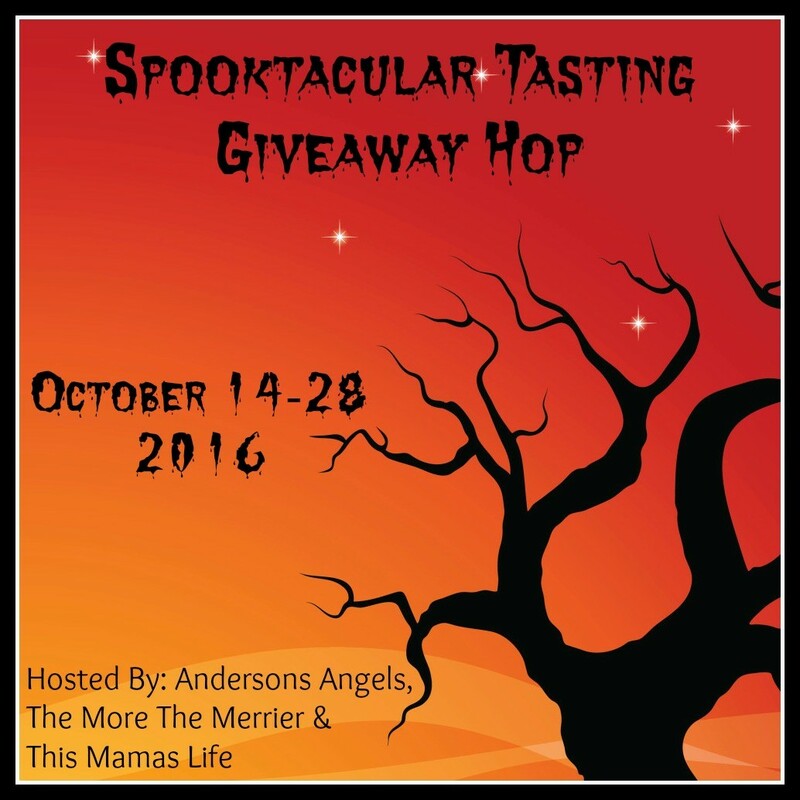 Welcome to the Spooktacular Tasting Giveaway Hop! "Hard to believe Halloween is just a few short weeks away! Now is the time when the kids start deciding what they will be dressing up as and mom -n- dad start planning the parties and goodies they need.. Anderson's Angels, This Mamas Life and The More The Merrier, are very excited about all the goodies that Halloween brings! We've teamed up with over 20 other wonderful bloggers, to bring you another great giveaway event! Each blog has gathered a Food Related prize package of $15 or more for The Spooktacular Tasting Giveaway Hop!" This is such a fun giveaway hop! There is a nice group of bloggers, who have come together, to bring a collection of delicious food related giveaways, for some lucky winners to win! Be sure to hop through the linky below, to maximize your chances, to win some awesome prizes! One lucky winner will receive a $20 Red Robin Gift Card! Disclosure: I received no compensation. I will be sending the prize to the winner. Must be 18 years or older to enter. Open to Worldwide entries, No P.O. Boxes. NO PURCHASE NECESSARY. This giveaway starts on October 14th, 2016, and will end on October 28th, 2016. Winner will be drawn via Random Generator on GiveawayTools, and will be announced on top of the giveaway form, as well as on the top "Winners" page. The winner will be emailed and will have 48 hours to respond to my email before a new winner will have to be drawn. If you're tweeting for entries, you must have an "unlocked" account. The number of entries received determines the odds of winning. VOID WHERE PROHIBITED BY LAW. Hosts & participating hop bloggers of the Spooktacular Tasting Event are not responsible for sponsors or self-sponsoring bloggers that do not fulfill prize obligations. Yes, I've been, and my favorite is the Whiskey River BBQ Chicken Sandwich. I have been to red robin and I love all of their burgers and their Guinness milkshake!! I have been to Red Robin many times and I love to order their gardenburger! I have been to Red Robin. I do not remember what the name of the dish was but there was one with shrimp and it reminded me of a meal I would have when I was a child and we went on vacation to florida. I can not wait to go back and have it again. Yes, I been to Red Robin. I'm partial to their guacamole burger but ask for the guac on the side or it's too messy. Then I just add a little on with a knife to the spot I'm going to eat next. I have been to Red Robin, and love the food, and my favorite burger is the New Tavern Burger filled with Mac and Cheese. It is so good! I really like their onion rings. We love Red Robin! I love their avo-cobb-o salad. I have been to Red Robins before,one of the things I love are the endless fries,they are yummy!! I love Red Robin, the Banzai Burger is my favorite. I have never been to Red Robin, but I love that girl in the commercials. She is so cute! No I haven't eaten at a Red Robin. There are all over Nadhville, TN. but haven't seen any in Indiana. Yes I love the hamburgers at Red Robin and their fries are good too. I've only been to Red Robin twice due to cost. If hubby and I split a burger (they're so big), it'd be more afforadable. I love their A.1.® Peppercorn gourmet burger! Yes, I've been to Red Robin several times. They have terrific burgers, I've tired several different ones. I have not been, but my husband says that it is really good! I have never been to Red Robin. Yes, a friend treated me to Red Robins for my birthday last month and I ordered my favorite there, the cheeseburger with pineapple and teriyaki sauce, yummy! Yes, I went to Red Robin last month. I like their Black & Bleu burger, so good! I recently went for my first visit with my daughter for lunch and ordered the bacon cheeseburger. It was amazing and we can't wait to go back. I love Red Robin, they are surprisingly vegan friendly! I rotate which burgers I get (always with the Boca patty) but I love the Burnin Love and the one with the bbq sauce and onion straws. I usually add jalapenos to every burger I order too. No, I never had chance to go to Red Robin. I would love to though. I actually haven't been to Red Robin. I know my niece & nephews love their burgers & I need to try it! I love Red Robin. Their cobb salad is delicious! I have never eaten at a Red Robin. I have heard they are really good, but I would have to try and find the closest one. I like the Sautéed 'Shroom. I have once awhile back. It was delicious, the burger was perfect and endless fries, Oh Yeah! We love going to Red Robin. My kids love their pizzas and I especially love their hamburgers, yummy! I've actually never eaten at Red Robin but have been wanting to. They opened one in my town recently, so this would be perfect for me. I have been to REd Robin-one of my favorite things is their onion ring tower! We have one here in town. Burgers, shakes, and fries. I get to go maybe once a year but my favorite thing is their onion ring stick thing and bottomless fries and don't even get me started on their sauces and milkshakes! My whole family loves Red Robin! My fave is their Southern Charm burger.So dang good! Yes, we go to Red Robin often. I love their cheeseburgers and french fries. 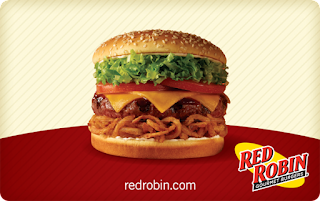 I've never been to Red Robin but from the commercials I've seen, their burgers look great. Yes, I have been to Red Robin several times. They have great burgers and fabulous fries. I haven't tried Red Robin yet. I've never been there but I've always wanted to try it out! My family and I love Red Robin! My favorite thing on the menu is the stack of onion rings. I have been to Red Robin. They have the best cheeseburgers. Red Robin is mine & my daughter's favorite place to go eat on our Mother Daughter dates. She loves the bacon cheeseburger with endless fries and I can't get enough of their Chicken Ceasar wrap with endless fries. Last but not least my favorite drink there is the Freckled Lemonade. YUM!! Their french fries are amazing! I also love their shakes! We love Red Robin! I love their bacon cheese burger, I know kind of plane jane, but hey I like it. Yes I have been to Red Robin a lot. My favorite item is the Whiskey River BBQ Wrap. I have been there, I liked their fries. I like their burgers with their onion tangles and I love their endless fries. Thank you! I was just at Red robin for lunch today! I have not been to Red Robin, but there is one at my favorite shopping center. I haven't ever been to Red Robin. I have not been there yet but my daughter has. She says their food is so good. Yes, I love their burgers! I have been to Red Robin numerous times and I love their Clamdigger's clam chowder and their Black & Bleu burger. My son took me and my husband to REd Robin once and we loved it!! My favorite was the endless fries!! I LOVE FRIES!! We love Red Robin! Their burgers are great and we enjoy the never ending fries with garlic aoli dip. I've been there a couple times a few years ago. I think I had a jalapeno burger that was really good. I love Red Robin! Their fries are my absolute favorite! I've only been to Red Robin once but I enjoyed it. Would love to go again. I have not been to Red Robin before but we do have a new one fairly close to us that we will be visiting. I have never been to Red Robin but would love to try their food. I've never been to Red Robin but will enjoy trying them out when I win. I have never been to Red Robin before. I always get the A-1 Peppercorn burger and a chocolate shake!